Below you will find answers to some of the most frequently asked questions I receive. As always, if you have any additional comments or questions, please go to my Face Painting Contact page. The further in advance the better, but it is really based on availability. Book earlier to ensure that I am able to come to your event. I will do events in Salt Lake County without any additional fees. Most other cities, within an hour drive from Salt Lake may be an additional charge to cover time and travel expenses. There may be no additional charge depending on the event. Please call or e-mail to check on travel fees. What type of face paint do you use? 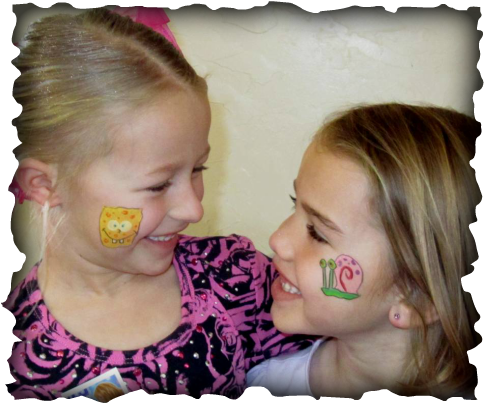 I use a variety of professional brand face paints to get the designs, colors and textures that look so great. I use Snazaroo, Wolfe Brothers, Diamond FX, TAG, FAB, Paradise and Arty Brush. These brands are okay for sensitive skin as well. All these brands are FDA approved and are easily removed with soap and water.